Pedaling the road: Shoemaker stay at your last? Photo by Roberto Bettini, downloaded here. Stefan Schumacher is back in the peloton. 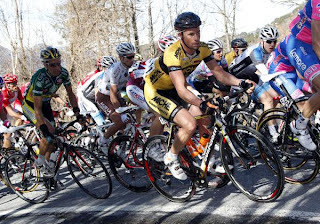 After his ban of two years for CERA in 2008 he was allowed back in cycling by the team Miche in 2010. Traces of CERA was also found in his samples from the Olympics in Beijing as well. Now Schumacher came back in 2010, so this is no big news really, despite the fact that it has been a long time since I've heard much from him. Some will say this is a good thing. Some of you might recognize the team Miche. Yes, it is the same team who let Michael Rasmussen into the warmth of cycling hospitality again. Or put in another way, there is probably a reason why an Italian small team like Miche took him in, I doubt any other team would, at least not a team in the World Tour. Team Miche is now called Miche-Guerciotti. The latter is a company producing all kinds of bikes while Miche is producing wheels, cranks, groups and chains. Now, Schumacher is back and apparently he does it quite well. Today he finished 8th place on stage 1 of Giro del Trentino, just ahead of Ballan, Kreutziger, Scarponi, Ignatyev and Popovych. The results are here. Let's hope he's not nervous about entering the anti-doping control after the stage. 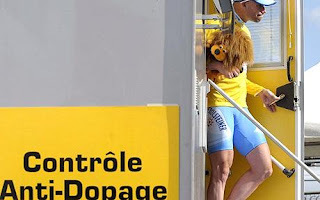 I just cannot understand the system for doping penalties in sport. A life ban should be imposed..there are too many tainted riders competing..but then ONE tainted rider competing would be one too many.